Wall Street traded most of the day in positive territory with the Dow and S&P 500 rising as much as 2.34% before finally slipping into the red the session’s final hour. The early advance came after Federal Reserve Chairman Ben Bernanke said that he would not allow any banks from hereon to fail, in a 60 Minutes interview yesterday. Mid-day trading revealed bad financial news that seemed to have forced some of the selling. American Express erased an 8.1% advance after reporting rising credit-card defaults. Despite this, Citigroup surged 30.90% to $2.33 after having traded at $0.96 two weeks ago. Bank of America also rose, by 7.29% to $6.18. The session’s day was filled with mixed performance. In fact, only 210 stocks in the S&P 500 finished up while 286 ended down. The Dow opened the day and traded most of the day in positive territory, rising as much as 2.34% before profit-takers forced the index down into the red in the final hour of trading. Basic Materials outperformed, rising 3.60% while Health Care plummeted 1.26%. Citigroup was the most active stock after seeing 287.02 million shares of its stock traded through the New York Stock Exchange. The S&P 500 had a mixed day, with only 210 stocks rising and 286 ending the day below par. The fear gauge, which shows the implied volatility of call options on the S&P 500, rose for a second straight day, by 3.25% to 43.74. Chairman Ben Bernanke gave his first interview since taking the helm of the Federal Reserve, with CBS’ 60 Minutes today. In it he stated that the biggest issue that may continue to threat the U.S. economy is a lack of action on the part of the political process to stem a potentially prolonged recession. 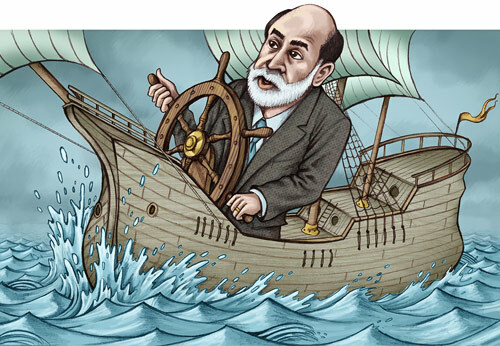 “The biggest risk that, you know, we don’t have the political will,” Bernanke said. During the questioning Bernanke stated that the era of “high living” ended with the collapse of the financial companies. It is also “hard to forecast exactly” the future trend in unemployment, he said. Bernanke also emphasized that the U.S. recovery will probably start in 2010, but that the bulk of the crisis will end by the end of this year. Stocks finished lower for a fourth straight day leaving the index closing sequentially in the red seven of the last eight trading sessions. Price action actually stayed in positive territory for about half of the session with the NASDAQ rising as much as 1.74% before quickly reversing course in the final hour of trading. All eyes were on Chairman Bernanke’s testimony to U.S. lawmakers today. In his remarks, Bernanke stated his case for the $30 billion bailout of AIG, saying “we really had no choice…bankruptcy is just not a good option.” When pressed about the economy, he stated that there was “considerable uncertainty” in many of the assumptions made by President Obama’s budget. Macroeconomic news continued to paint a bleak picture with Pending Home Sales slipping -7.7% with economists expecting less than half of that. December’s estimate was revised substantially lower, from 6.3% to 4.8%. While overall stocks finished the day relatively flat compared to previous days, small-cap stocks actually took a much larger toll when compared to their large-cap counterparts. The top 10 stocks by market capitalization actually rose today by an average of 0.53% while the bottom 10 stocks by market capitalization plummeted by an average of -9.37%. The Dow began the day in the green before a rollercoaster day sent the index in a negative direction. Despite most sectors performing poorly, the Financials actually rose by 1.75% with American Express leading the way after spiking 6.87%. The NASDAQ grew was much as 1.74% before being weighted down in the final hour of trading. Individual sector performance was diverse in that two-thirds actually finished higher. Information Technology and Health Care finished a hair above water. Utilities in the S&P performed the worst, plummeting -3.58% while Information Technology and Telecommunications rose. Energy also finished the day up after oil jumped $1.50 or 3.74% per barrel. The VIX ultimately fell because the equity indices traded above water for a substantially period. The volatility index fell 3.26% to 40.93. Every sector in the Dow Jones Industrial Average finished the day in the green. In fact, each category rose at least 1.96%. Financials saw the larges gains, rallying 11.30%. Financials and Telecommunications led the NASDAQ’S rally, seeing each sector rise 6.46% and 5.20% today. Volatility tumbled today, seeing the VIX index plummet 13.54% to finish the day at 45.49. The S&P 500 also saw every sector in the index finish the day above water.